We used many resources and pulled from a variety of change theory activists in order to develop a planning pathway that worked within the context of this school. As such we recommend NOT using these tools and resources like a program, but rather as guides to developing your own map for your learning journey. Let's get started by discovering who we are, and why we should care about others. What can you add to your identity map? If you had a magic power that enabled you to make changes to the world, what 3 things you would wish for? Why? ​Write the 3 most important ‘treasures’ you believe your parents want you to have. How do you know? Are these the same ‘treasures’ you would choose for yourself? ‘No’ - What are yours? Why? What do you feel is your most important responsibility until ‘the very last day’? After watching this interview with Aida, how has your thinking changed? What is the circular economy? How will it help us create a sustainable future for all life on Earth? 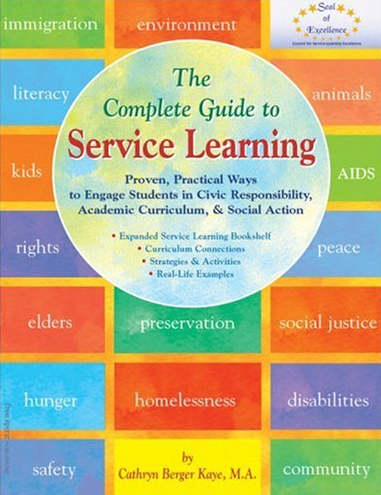 The Complete Guide to Service Learning is the go-to resource in the fast-growing field of service learning. It is an award-winning treasury of service activities, community service project ideas, quotes, reflections, and resources that can help teachers and youth workers engage young hearts and minds in reaching out and giving back. Author and internationally known service learning expert Cathryn Berger Kaye presents service learning—its importance, steps, essential elements, and challenges—within a curricular context and organized by theme. This second edition maintains the easy-to-use format of the original and is enhanced with updated information on service learning programs and pedagogy. A is for Action helps students improve their self-esteem (believing that they can, in fact, make a difference), become more confident in their abilities to problem-solve, and inspire them to change the world for the better, empowering them to tackle issues. This book was created as a result of peer reviewed research (published in the IB Journal of Teaching Practice on February 28, 2013), includes an online component, featuring: curriculum resources, extension activities, students showing the book’s lessons in practice, and videos; It also includes worksheets and suggested Action organizations. Today more than ever, we prize academic achievement, pressuring our children to get into the “right” colleges, have the highest GPAs, and pursue advanced degrees. But while students may graduate with credentials, by and large they lack the competencies needed to be thoughtful, engaged citizens and to get good jobs in our rapidly evolving economy. This book changes that. ​Our school system was engineered a century ago to produce a work force for a world that no longer exists. Alarmingly, our methods of schooling crush the creativity and initiative young people need to thrive in the twenty-first century. Access the Google document here to make a copy for your own learners.